On this page, you will find a broad selection of recipes. I say recipes, but as you will see my idea of cooking is pretty relaxed, and not very structured. Don’t expect ‘250 grams of this’ and ‘half cup of that’ and precise times, temperatures, etc. I tend to measure most things by ‘the handful’, and my cooking times are based on trial and error. This is not because I am hopelessly inept in the kitchen, this is because I believe that the best healthy cooking should be basic, not fancy and over-complicated. Ingredients should be minimal, ideally only 2 or 3 things to a meal, rarely more than 5 or 6 as a maximum. Most meals I cook, are based around throwing a few ingredients in the oven, or in a pan, or in a steamer, and warming them up a bit, then we’re all done. Nothing complicated or demanding involved. I am working on putting together a recipe book / cookery book for you to download from this site. That will be somewhat more structured, and better organised, but for now, the ideas on this page should give you an idea of what MND style cooking is all about. Simple, earthy, basic. MND is about embracing nature and stopping this trend of making food into a 24/7 leisure activity, so don’t expect the meals below to feature intricate fancy recipes, dozens of ingredients and meticulous presentation on large white plates. The food I cook is basic, mostly meat and vegetables, nothing too fancy. This is real cooking, for real people, with busy lives. This is honest, hearty, healthy REAL food. 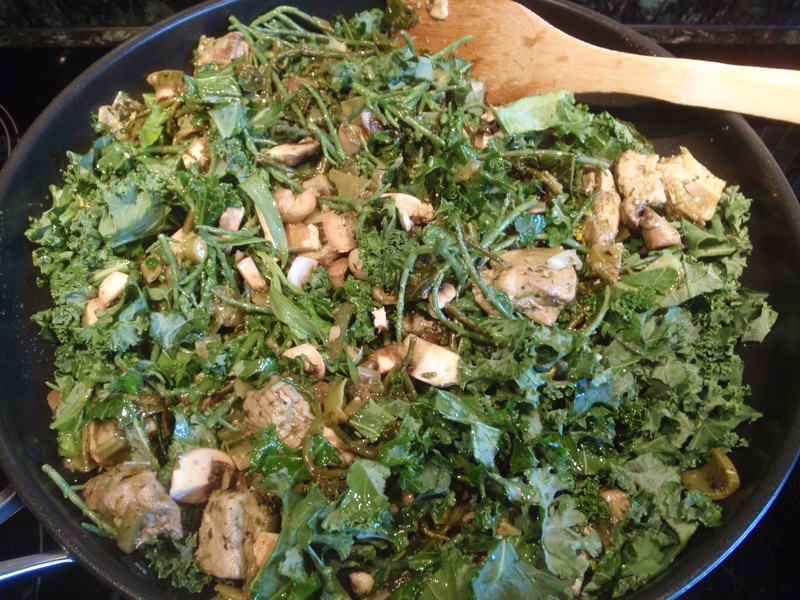 This is how I like to do eggs – I slip a dash of extra virgin olive oil in the pan and then stir fry a handful of kale around til it softens a little, then crack 3 or 4 eggs in and scramble away. Breakfast in less than 5 minutes. I have been adding greens to my eggs for so long now that eggs without greens taste bland to me. 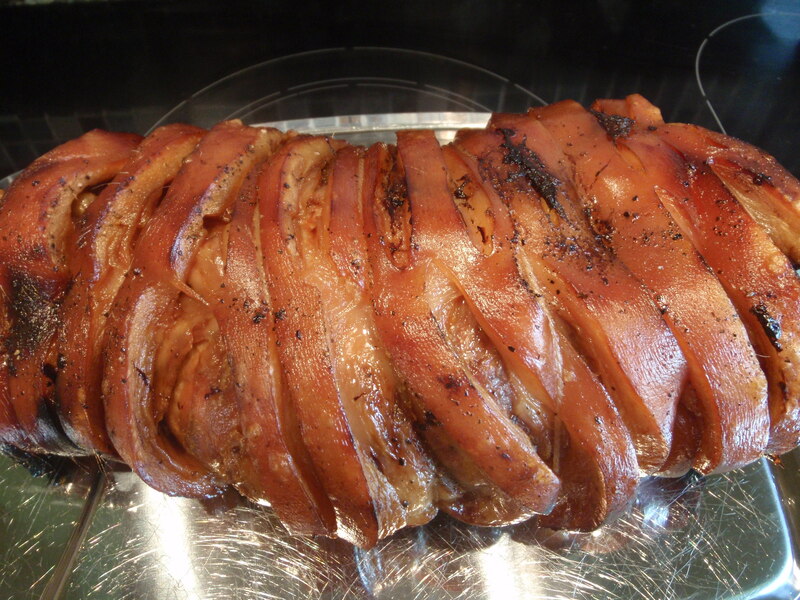 My favourite meal is this delicious slow-roasted pork shoulder. For me, this ticks all the boxes in terms of the most primal/paleo/natural meal I can eat. Animals of the pig family (wild boar) are natural inhabitants in Europe, and I buy my pork locally where I can see it reared outdoors in the mud, the rain, the sunshine. A slow roasted pork joint served with steamed seasonal veggies and nothing else (no apple sauce, no gravy, no starchy carbs, just meat and vegetables) is perfect fuel designed by Mother Nature. Slow roasted, the meat is tender and juicy, and the shoulder contains enough fat to keep the meat sweet and succulent. If lightly steamed, the veggies retain enough of their natural waters that they are still ‘wet’ to taste, not soggy from over-cooking. Together, this meal is moist and refreshing and you should not need a drink with it. Provided you are healthily hydrated before eating, you do not need gravy, a glass of wine, or anything else to wash this meal down. It’s a Jamie Oliver recipe, I’ve put the link to his site below, though personally I don’t make the gravy that he does and I keep the whole thing pretty simple. I literally just stick the pork in, a quick shake of salt and pepper, and cook it, done. Nothing else, so although this recipe from Jamie is where I started, now all I am using is his recommended 6-hour cooking time, the rest is just detail. 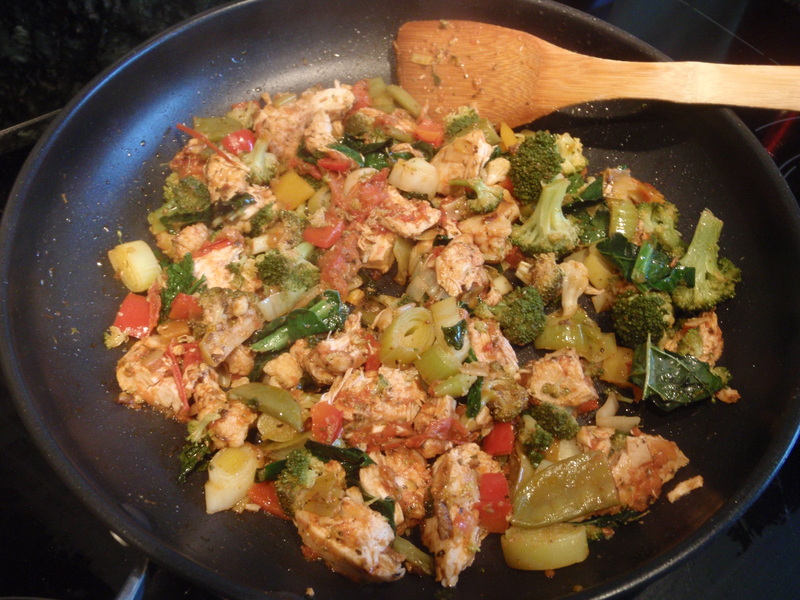 Like I have said before, I like to keep my cooking simple…pre time for this, just 2 minutes! I’ll copy the text here for you (copied from Jamie’s page) for how I cook this, but refer to his page for the full text including the instructions for making the gravy if you feel the need to do that too. This is a proper old-school Sunday roast with crackling. Leaving the bone in adds a bit of extra flavour and having a layer of fat helps to keep the meat nice and moist as it roasts. This isn’t the kind of joint you carve into neat slices. If you’ve cooked it right, it should pull apart into shreds with a couple of forks. If you’re worried about scoring the crackling yourself, ask your butcher to do it for you, that’s what he’s there for. Place your pork on a clean work surface, skin-side up. Get yourself a small sharp knife and make scores about a centimetre apart through the skin into the fat, but not so deep that you cut into the meat. If the joint is tied, try not to cut through the string. Rub salt right into all the scores you’ve just made, pulling the skin apart a little if you need to. Brush any excess salt off the surface then turn it over. Season the underside of the meat with a few pinches of salt and pepper. Place your pork, skin-side up, in a roasting tray and pop in the preheated oven. Roast for 30 minutes, until the skin of the pork has started to puff up and you can see it turning into crackling. At this point, turn the heat down to 170°C/325 F/gas 3, cover the pork snugly with a double layer of tinfoil, pop back in the oven and roast for a further 4 and a half hours. Take out of the oven, take the foil off, and baste the meat with the fat in the bottom of the tray. Carefully lift the pork up and transfer to a chopping board. Spoon all but a couple of tablespoons of fat out. Add all the veg, garlic and bay leaves to the tray and stir them into the fat. Place the pork back on top of everything and return to the stove without the foil to roast for another hour. By this time the meat should be meltingly soft and tender. Carefully move the meat to a serving dish, cover again with tinfoil and leave to rest while you make ready to serve. I serve mine with broccoli, carrots, cauliflower, or whatever seasonal veggies I have in. Delicious! So you’ve cooked the recipe above, and there is leftover pork for lunch the next day. Stick heat under a pan, slip in a drizzle of extra virgin olive oil, throw in some greens, throw in some pork, stir fry for a couple of minutes, just enough to warm everything up and soften the greens. Lunch, done in 5 minutes. No access to a cooker? 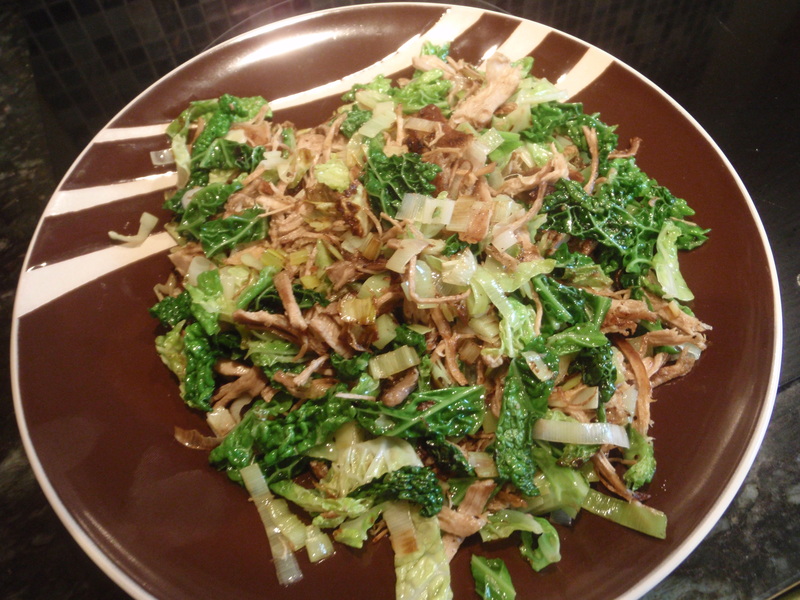 Make a salad, in Tupperware, thrown the pork in cold, shredded. Easy. No pork? Use chicken…lamb…turkey…see, it’s easy! I had free-range goat for lunch today, I think that was the first time I have eaten goat. It was OK, nothing special but OK, kinda like lamb, but cheaper. 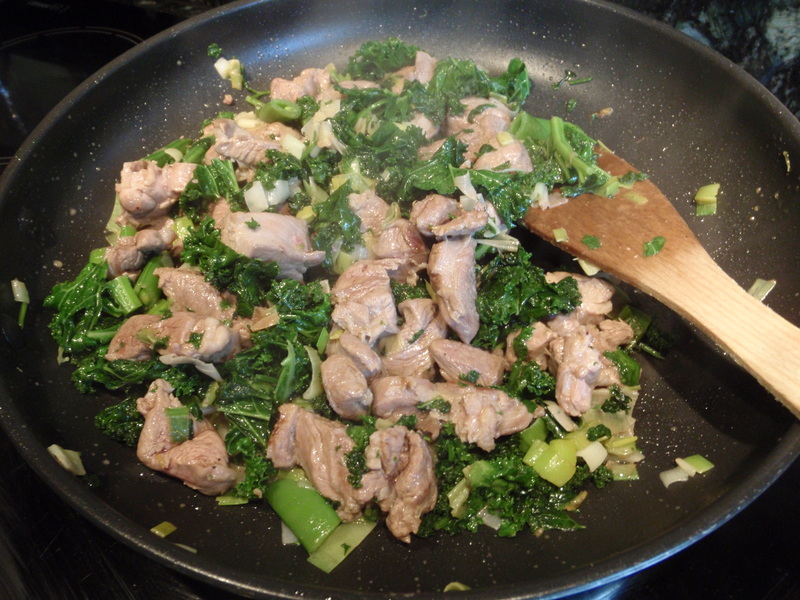 I chopped up a leek, then the goat, diced up, then I threw in a few handfuls of kale and some sugar-snap peas. Stir fried that lot for ten mins, chopped in some fresh parsley and basil from my herb garden, and added a sprinkle of black pepper. That was it. All good. Tasty. It tastes a bit like lamb. I think if I could get a joint of goat, or goat chops, that would go well cooked slower, to keep it tender, as it can be a little chewy. I don’t know if I can get a joint of goat, but if I can, I’ll try slow roasting it and then I’ll post another recipe and let you know. Otherwise, if I can get goat chops or some kind of big chunks of goat, it would probably be great done in the crock pot in some stock to keep it moist and tender. A culinary adventure for another day! 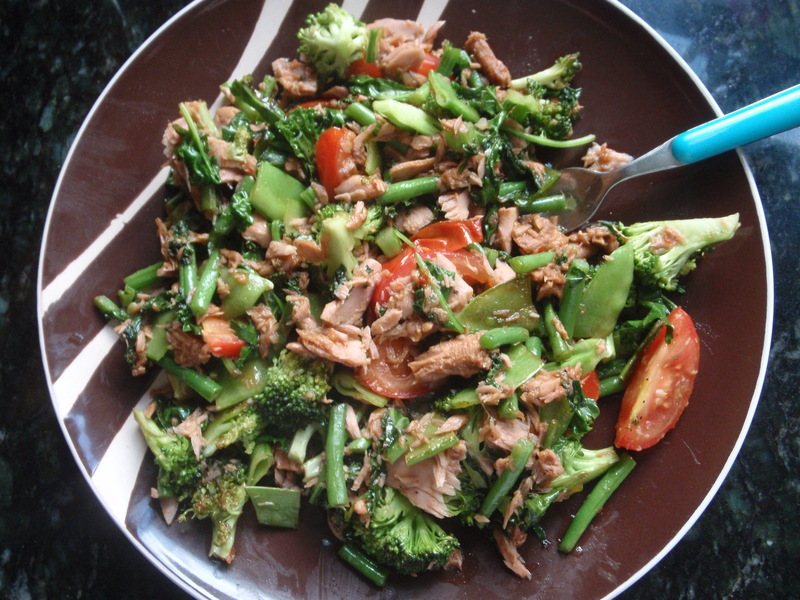 This is another simple but nutritious quick and easy meal. 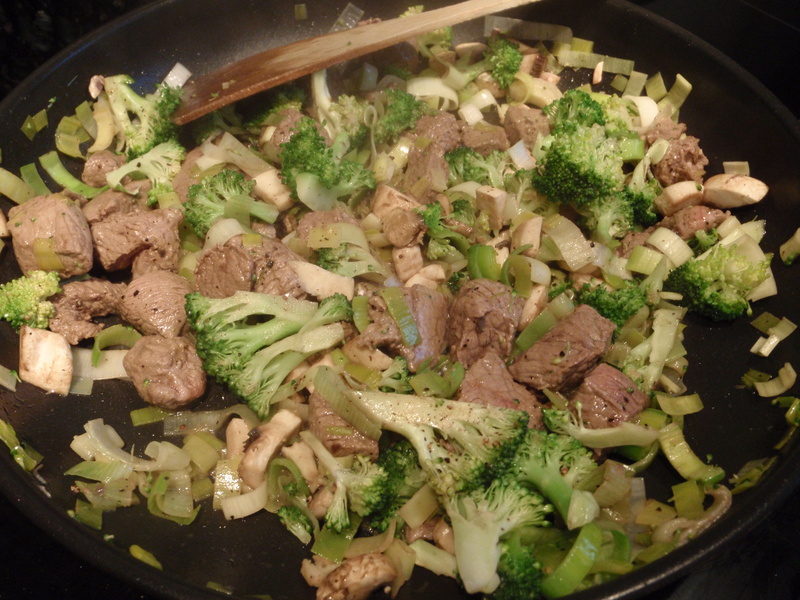 I chopped up a leek, threw that in the pan, then I diced up 400 grams of beef (about a pound of beef) and a fistful of broccoli. Fried that lot for a few minutes, in went a fistful of mushrooms chopped up. Lashings of black pepper and some fresh basil and parsley at the last minute as I turned the heat off. Ready in under ten minutes. It wasn’t exactly delicious, if I’m being honest. I think most folks would say it was pretty bland, but as you know, I am into eating food that tastes like food, not smothering everything in some sugar-laden chemical sauce, so for me, it was great. This is real food, the kind of real food I eat every day. Real food does not taste sweet and mouth-wateringly delicious, that should be saved for special meals, no more than once per week. The food we eat every day is ‘fuel for living’, and this meal is just that. Enjoy. This meal is the perfect winter warmer and is so easy to make. I bought 1.5 kg of braising steak from the local farm shop. Stir fry a couple of onions chopped up, a couple of leeks chopped up, and the diced up steak. Just whizz them around on the heat long enough to soften the onions and leeks and brown off the meat just a little, to seal the flavours in. Throw the lot in the crock pot with half a dozen chopped up carrots and then enough beef stock to cover the contents. I don’t like to use stock, but just water and herbs would detract from the taste and then my kids wouldn’t eat it. I’d rather make that one concession, add the stock, and then see the whole family enjoy the meal and eat it all up. The alternative, to stay ‘stick’ to MND and not add the stock, would result in a meal that would taste far inferior and my kids likely wouldn’t enjoy it. This is a classic example of using Rule 12 from the 12 Core Principles – the 90/10 Rule. 1 small concession makes the whole thing a success. It’s taking a step back from ‘perfection’ and living in a way that is practical and sustainable, that’s what MND is all about. Chuck the crock pot on low or medium heat and let it bubble away for as long as you like. Ours had about 8 hours the day I took this picture, stirred around a few times, mostly on low heat. That’s it! We served it with a little rice just for the kids, to help them bulk up their meal, and we had a little steamed broccoli on the side. This picture shows roast lamb with green veggies and mushrooms. Mid-week, I picked up a cheap shoulder of lamb from the farm shop, so I stuck it in the oven for a few hours while I was working, and then voila! It takes just 5 minutes preparation, it’s easy, and once done, I get 3 or 4 meals from one small roast joint…lunch for most of the week! It takes virtually no effort at all…I just trim off any visible excess fat, rub the thing all over in olive oil, and sprinkle on a little black pepper. Then tuck it in the oven well covered in foil and 4 hours later, delicious slow-roasted pulled lamb is ready. 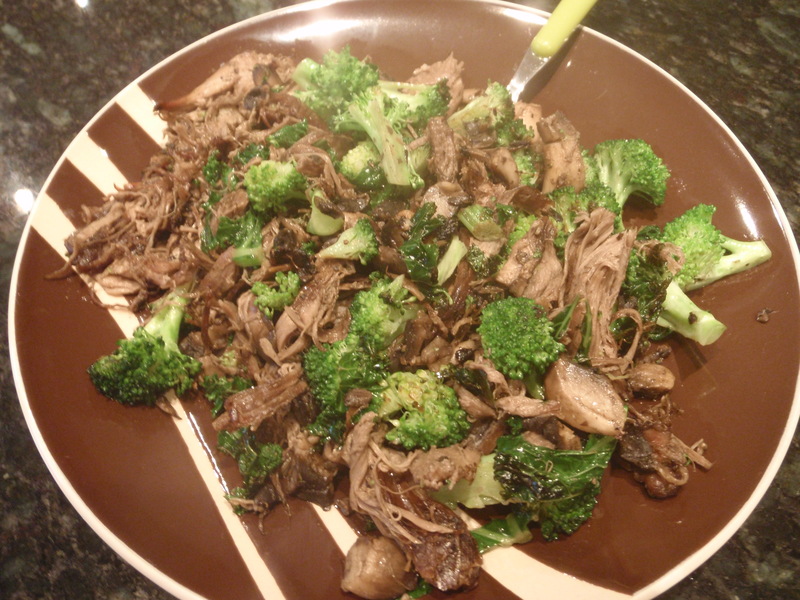 Once the joint is pulled (shredded) then on subsequent days, I take some left-over lamb, toss it together with some broccoli, kale and mushrooms, heat it around my pan for 5 mins with a sprinkle of black pepper, and lunch is done. Prep time – 5 mins. Available – anywhere (in this country). Estimated total cost of this meal – about 5 pounds. Nutritional content excellent: free range meat and green veg – superb. 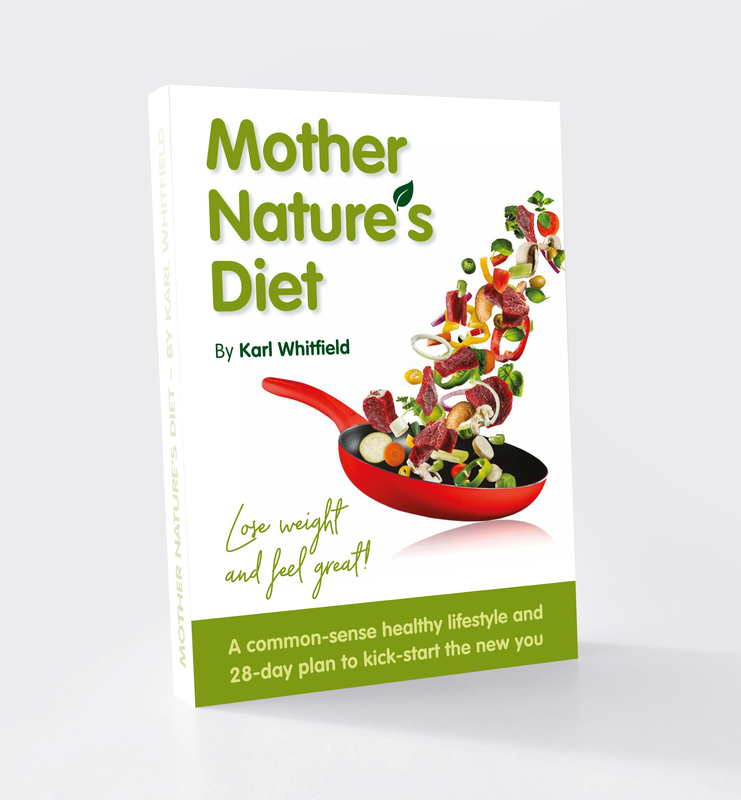 This all-natural healthy cooking business really is SO easy, there is NO excuse to eat rubbish. Note: For those of you who have spotted my recurrent theme, you may have realised by now, just how easy this all is. Throw some meat and a few veggies in a pan with a dash of extra virgin olive oil, stir fry for 5 minutes, add pepper or fresh herbs in the last minute, serve and eat. Who knew healthy cooking was so easy! That’s it really, and there are almost endless combinations and possibilities, and it’s all healthy and all nutritious and all dead easy and all delicious. Have fun! This is the same as the last ‘Breakfast of Champions’ only using sausages instead of bacon. I had some sausages left over which I had grilled on the previous day, so I chopped them up and used them. Equally easy, I use left over meat from any meal, roast pork, roast lamb, chicken, anything. This takes just 5 mins to prep, it’s quick and easy. 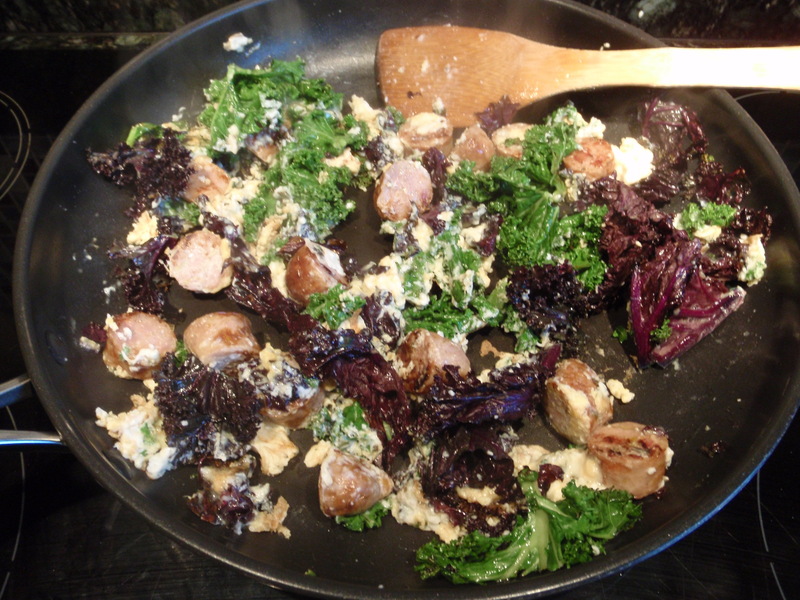 As before, heat on, dash of extra virgin olive oil, rough chop the kale in first, then chop the sausages/bacon/pork/lamb in then stir fry around for 3 mins, then turn the heat off as you pop a few eggs in and they are all done in seconds. 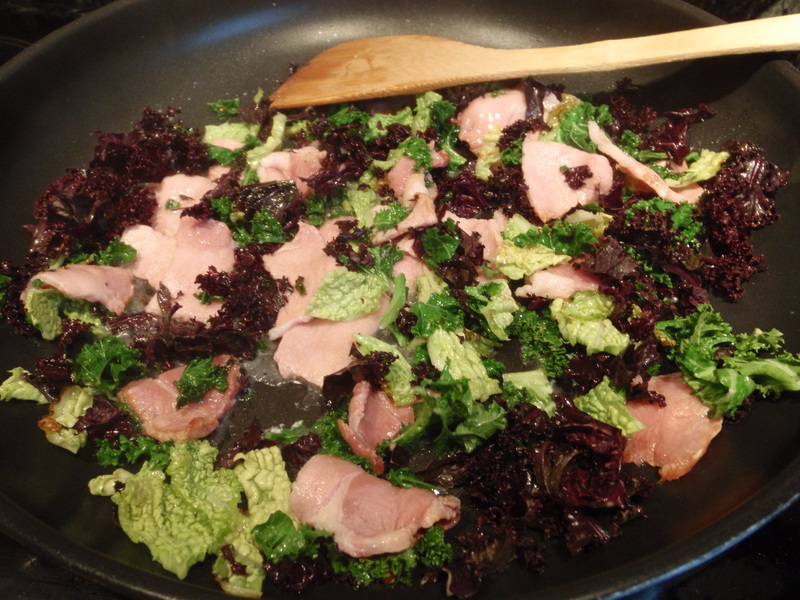 As below, start with just a drizzle of olive oil in the pan, then throw in a good handful of chopped up kale, then throw in a couple of rashers of free range bacon. I cut my bacon up with scissors straight in to the pan…it’s the quickest and easiest way to do it. 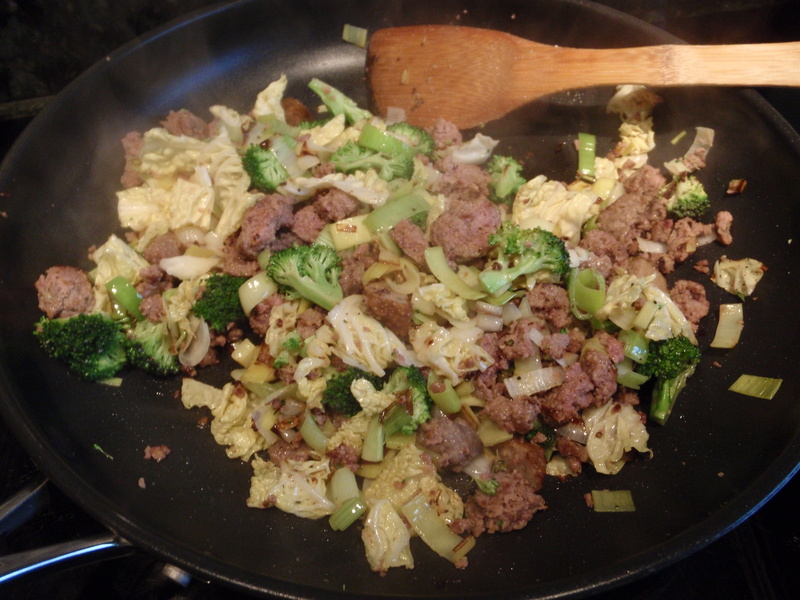 I stir fry this around for 2 to 3 minutes, then crack in 4 or 5 eggs and give it 2 minutes more. Done, a hearty breakfast, total time to prep and cook is max 6 minutes, and on a good day this will keep me going for 7 or 8 hours if need be. Make it light – 1 rasher and just 3 eggs. Bulk – 3 rashers and 6 eggs. Go all day! Voila, quick and easy cooking. Enjoy. 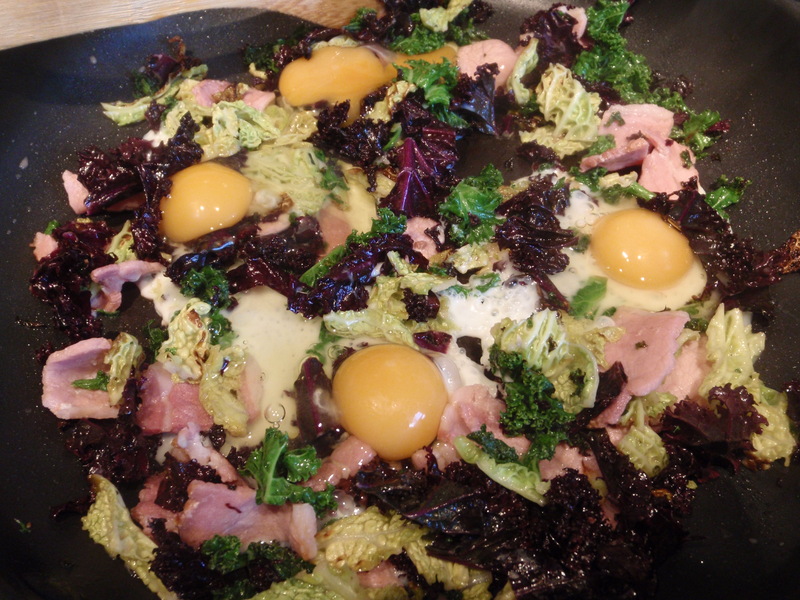 Way to eat breakfast – free range ‘happy pig’ bacon and savoy cabbage. 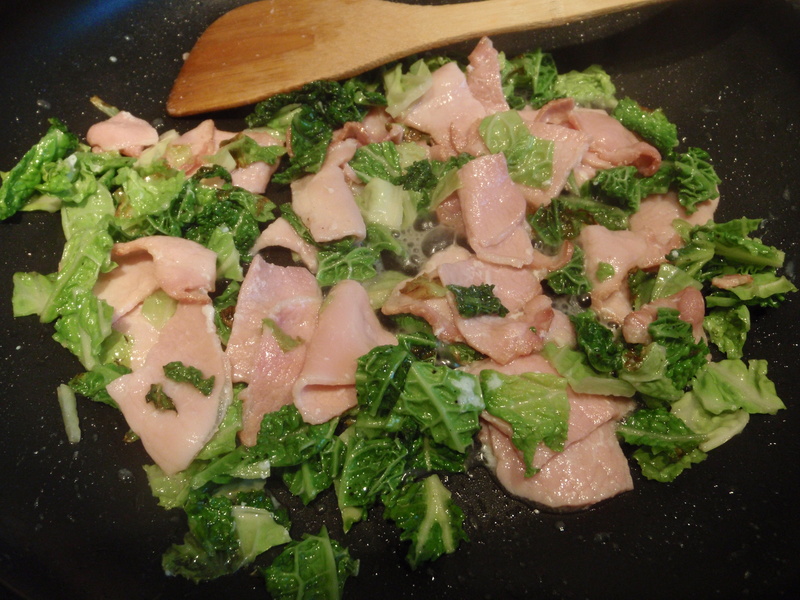 That’s it, 5 mins in the pan for the bacon, a little less for the cabbage, just so that it’s softened off. If you want to, at the last minute, you can throw in a couple of eggs too, yummy!! 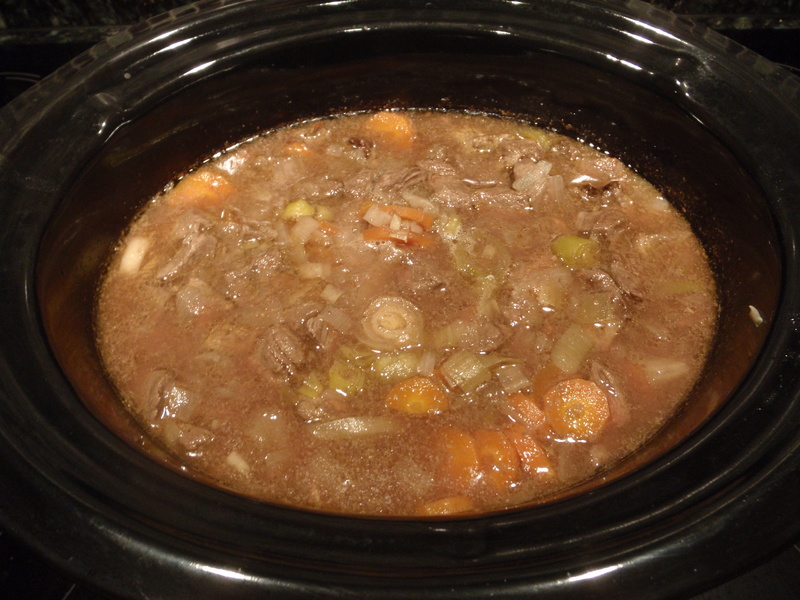 Recipe of the Week – Venison and veggies! Here is another former ‘Recipe of the Week’ – and any of my regular readers can guess how this recipe is going to work. Start with a drizzle of olive oil in your pan. Then I chopped up a leek and threw that in. Then some broccoli, then some cabbage, then the venison. These were home made venison sausages, which I had already cooked under the grill a couple of days ago. I’m not very good at making sausages (with no skins) so they have a tendency to fall apart a bit, so I was just using up the last of them today, so I chopped up what was left and threw it in the pan. I stir fried this for just 5 mins, and with a drizzle more oil today as it was a bit dry looking, and a big pinch of black pepper. I am not really trying to cook the vegetables, they are really only in the pan long enough to warm and soften, that’s all. I use a heavy-based pan, so the head spreads out and warms the food gently and evenly. The object is not to burn anything to a crisp. This meal is nutritious, primal, basic, quick and easy. No sugar. No carbs. No junk. No additives. No chemicals. Just protein (I had trained hard doing circuits before lunch) for my muscles and lots of good veggies, full of vitamins and minerals. This lunch is also a good seasonal winter option, using seasonal veggies and wild local caught game – the butcher told me that the farmer who supplies this meat shoots the deer on his own land every week. It’s humane, sustainable, local, seasonal, fresh, organic (wild), free-range (wild!) and it’s as good as food gets in my opinion. You can taste that fresh wild game taste, it’s strong and earthy, and in my opinion it’s a good reason not to spoil food with some sugar-laden sauce from a jar. This was natural, delicious and nutritious. This is actually a picture from New Year’s Day 2013. This was my lunch, yummy! I started 2013 with a banana and sweaty hour out on my bike, and then this juice feast was my first proper meal of the year – this is how to start a healthy year!! I then poured this juice into my blender on top of a good fist full of fresh parsley from my herb garden, and a few random pieces of soft fruit I had lying around (mostly mango and a few blueberries and raspberries, oddly!) and the flesh of one whole avocado. Add just a little plain water. 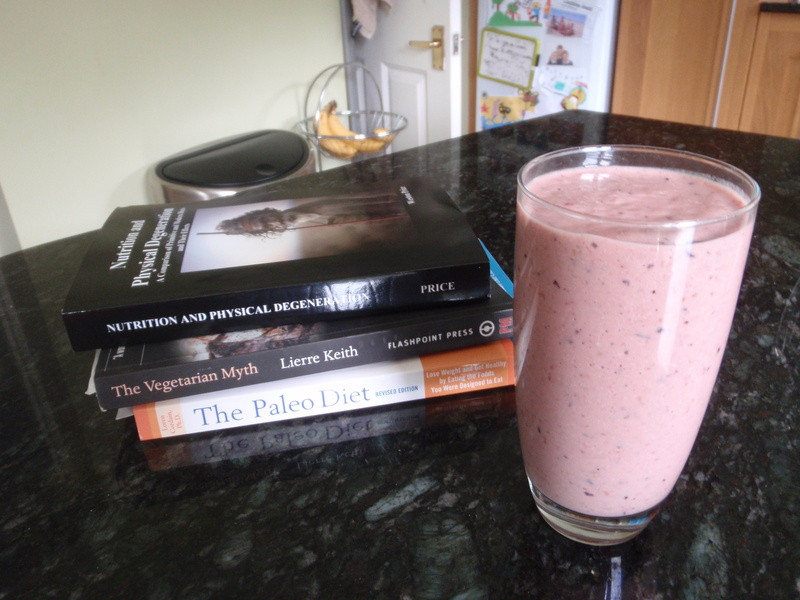 Blended and consumed over about an hour, a delicious and nutritious (and gingery!!) lunch. 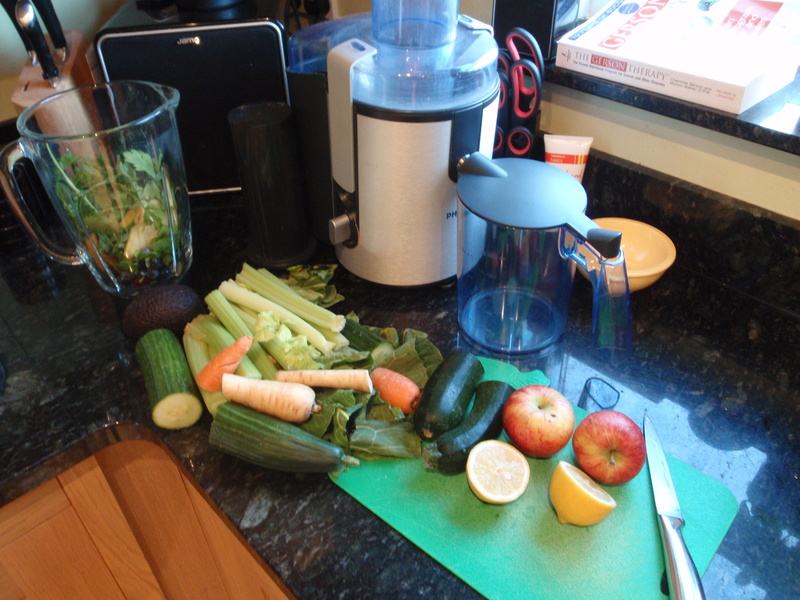 This made a blender-full, so I got about 3 large glasses of juice from this lot, it was tasty and very filling. This is simple, but nutritious and delicious. Serve these Mediterranean-style vegetables up with whatever you are cooking – a roast joint; beef steak; lamb chops; chicken cooked in the oven, lamb steaks, pork chops, organic sausages, BBQ burgers (make sure you buy good quality burgers)…or just have the veggies and nothing else! I usually start with onions, leeks and broccoli. I add peppers, kale, tomatoes, mushrooms, and pretty much anything else I like. Soft things only need a few minutes – that’s mushrooms, peppers, tomatoes, cabbage, spring greens, carrots, etc., whereas the onions, leeks, carrots and broccoli need a tad longer. Don’t let things burn, keep the heat medium and keep things moving. Add anything you like, the cooking is really just enough to warm and soften, that’s all. Add black pepper, Italian seasoning, fresh or dried herbs, cashew nuts, pine nuts, walnut pieces, almonds, a splash of tomato puree…just play with it and try different things until you find the best way that works for you. If my kids are eating, I will go for more colours, like the peppers, but if it’s just for my wife and I, then we stick to mostly greens. Here is another former ‘Recipe of the Week’ – I cooked up a delicious tuna and vegetable lunch and I thought you’d appreciate me sharing with you. Drizzle of olive oil in the pan, then I threw in some chopped up broccoli, green beans, mange tout, curly kale, fresh spinach and a couple of fresh tomatoes. I started the heat and threw in a can of tuna (I know, I don’t like canned food either, but I don’t live anywhere near the ocean and it was MSC-approved, sustainably fished, pole-and-line caught tuna) and a handful of fresh herbs to mix up the flavours. Stirred it around on the heat for just a few minutes to soften the vegies and warm everything up – not raw but not really cooked either. After one of my tough early-morning training sessions, crawling around face down in the mud getting sweaty at 6:30 am, I like to cook up a muscle-replenishing hearty breakfast. This feast was a fridge raid, a case of grabbing a handful of whatever I had, some left-over organic outdoor-raised free range chicken, lots of fresh tomatoes, broccoli, mange tout, peppers, leeks, kale, sugar snap peas, red onion and herbs from my garden (basil, coriander, oregano) and black pepper. As the chicken was already cooked, I just diced it up and threw everything in the pan for a 5-minute heat up. Delicious, and packed with goodness. 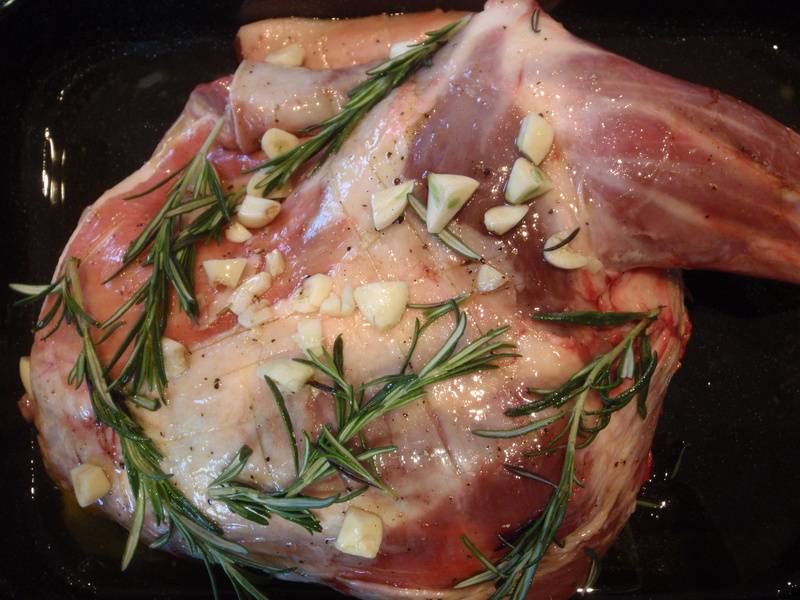 Try this mouth-watering 4-hour slow roasted organic shoulder of lamb, good any time, any day. Sometimes I’ll do this for our family Sunday lunch, other times I’ll do this just for myself on a Monday, then eat the left-overs for lunch all week. Delicious! The picture shows the roast about to go in to a medium oven for 4 hours, just lamb, a quick rub of olive oil to moisten the skin, rosemary grown in my garden, some garlic and a sprinkle of black pepper. After 4 hours roasting (double covered in foil) it was as tender-as-you-like, it just fell apart using two forks (this is called pulling, when it just pulls apart) and the bones just fall out – no carving required. Soft, juicy, tender, absolutely fabulous. Cooking times are pretty relaxed at this lower heat…it could have almost anything between 3 and 6 hours and it would be fine. Don’t be afraid to experiment until you cook your perfect joint. If my joint is around 2 kilos, I’ll cook it about 4 hours at a heat of about 150 to 160 (temps in centigrade, though my oven runs hot, so you may want to add 10 or 20 degrees to what I say) but if my joint is nearer 3 kilos or over, I’ll roast it for about 5 hours. It’s all pretty flexible, so experiment! This is SO packed with ALL the important NUTRIENTS folks – this is like super-car fuel for your body. Makes you go Vrrroooommmm!! Free range outdoor-raised organic diced pork, red onions, my own body weight in kale (yes…I have said before, I eat kale EVERY day!! ), lots of samphire (salty seaweed stuff, very good for you), a heap of herbs from my garden, chestnut mushrooms, a few green beans, a few sugar-snap peas, a little mange tout, a green pepper, a good sprinkle of black pepper…talk about a nutrient-dense feast for your body!! I just raked through the fridge for anything green and threw a handful on my chopping board. There are no set rules, you will realise by now, my recipes are simple, basic, rough, and different every meal I cook. Cooking is so easy on MND, because everything in my fridge is just plain, real food, so I can throw anything together and it just works. I stir fry the pork and red onion first, then throw everything else in and stir it around until the greens are JUST warmed and softened. Voila, done, start to finish in about 15 minutes. Don’t cook the living daylights out of all those tasty greens, literally just push them around a hot pan for 5 mins so they soften and warm, and that’s it. 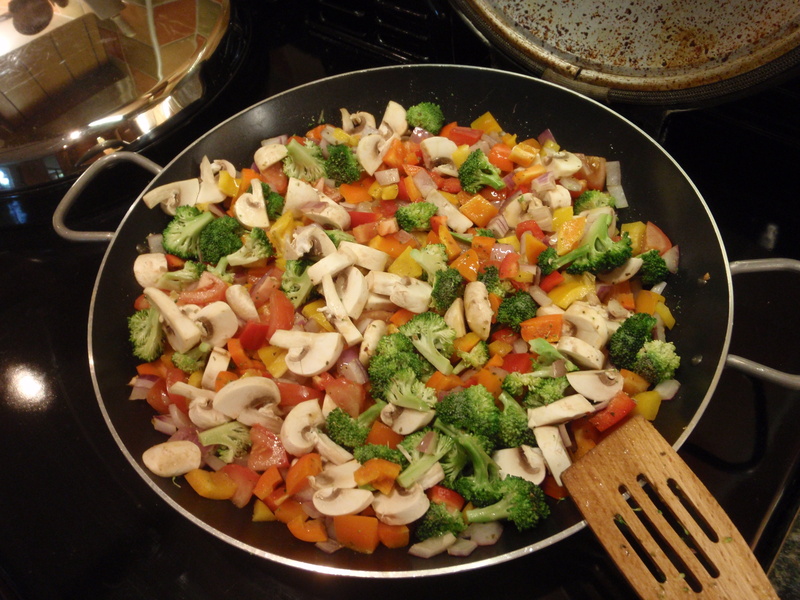 If you over cook your veggies, you lose half the nutrients. Delicious and loaded with goodness, really loaded. 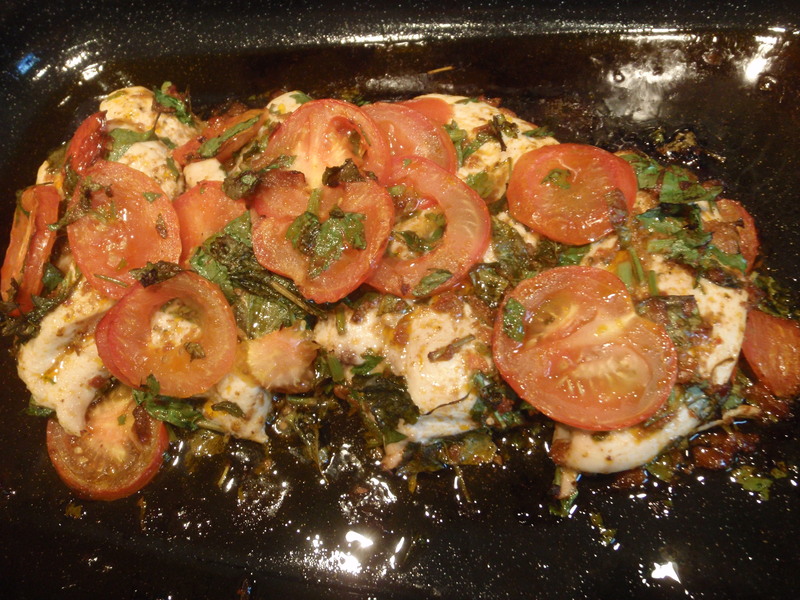 First pic: I took 4 free range organic chicken breasts, laid them in a baking tray, and smeared them with a tomato sauce. The sauce is made from tomato puree, chopped tomatoes finely chopped up (using a Slap-Chop), a few pine nuts, chopped and crushed, some black pepper, a couple of teaspoons of sun-dried tomato pesto sauce and a sprinkle of Italian seasoning. It is also possible to make your own pesto sauce. The shop bought ones, frustratingly, have salt and sugar and additives in them, which I will use sparingly, but it is better, if I have time, to make my own. Look out elsewhere on this page for my home made green pesto recipe coming up sometime soon. 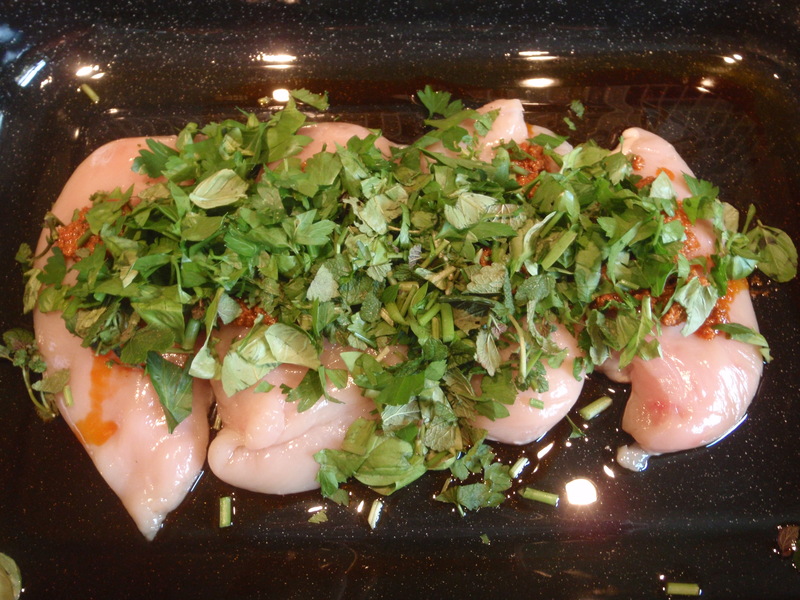 I spooned the sauce onto the chicken then picked fresh herbs from my garden – basil, lemon balm and parsley, and chopped them up and sprinkled them all over. As I chopped up all those herbs the smell was divine! 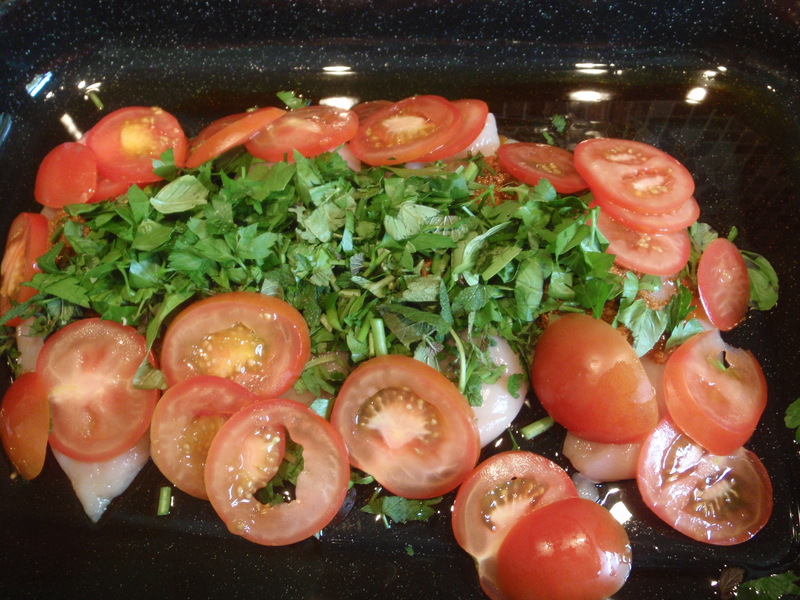 Next, I covered the lot in fresh tomatoes, as you see in the second picture, then I rubbed it all together and pushed the herbs into the chicken as best as I could (make little knife slits in the raw chicken first, then you can massage the sauce and herbs into the flesh to really work the flavours in). an hour in a hot over, or an hour in a warm oven…I’m not an ‘exact science’ kind of chef, I don’t really follow recipes, read instructions or do as I’m told…I just make things up as I go along, and it usually all works out just fine! This had about 40 to 45 minutess in an oven I had pre-heated to about 190 (temps in centigrade), but dropped to about 160 after ten minutes as it looked a bit too hot to me. The fresh herbs burn in the oven, but only where they are ‘loose’, not where they are worked into the meat, there the flavours are really tasty. And voila! 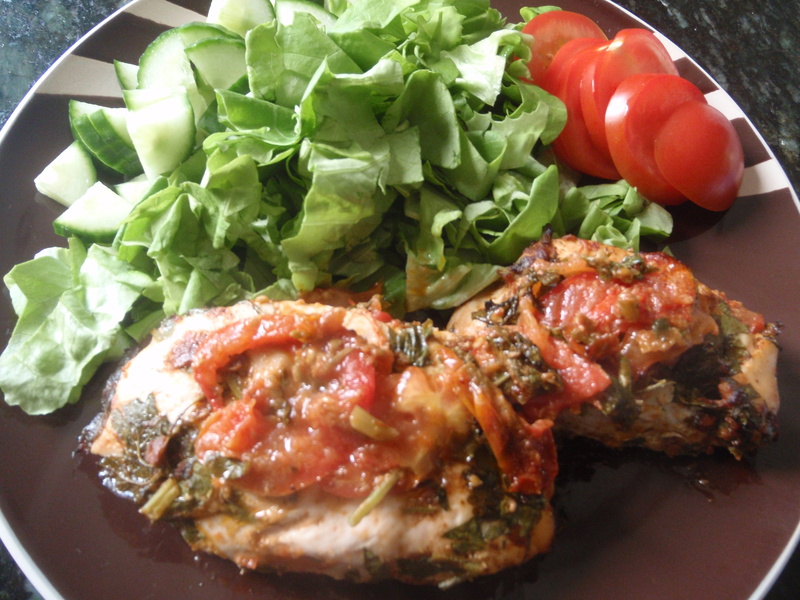 Served up with a little salad, it was delicious, the chicken was so tender, and the herb flavours really came through…yummy! Natural, delicious, quick, easy, nutritious…get stuck in! 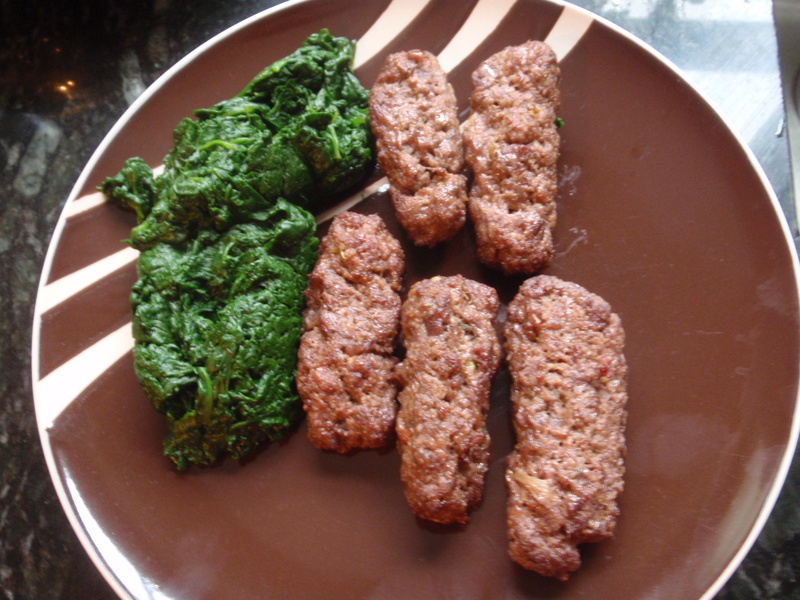 Here is one of my less-than-amazing looking creations: rough home-made wild venison sausages, served with spinach. Total ingredients: 2 things. That’s pretty simple. I was lucky, my butcher was making wild venison sausages when I got to the counter, so I asked him for a kilo of the minced meat, just like that, no sausage casing or anything. I rolled these into sausage shapes, and yes they are rather dry and fall apart, but who cares. I grilled them and then ate them with a mass of fresh boiled spinach. It took 5 minutes to roll my sausages into shapes, the pic shows 5 finished cooked sausages, my kilo of wild venison meat made 10 of these. The grilling took about 15 mins, and the spinach took 5 mins to boil down. Wild venison sausages, and a big heap of cooked spinach. Loaded with B vitamins, protein, iron and goodness. A great hard-core paleo lunch after a heavy weight training session. This meal certainly packs some natural nutrients!! Quick, simple, easy and delicious! 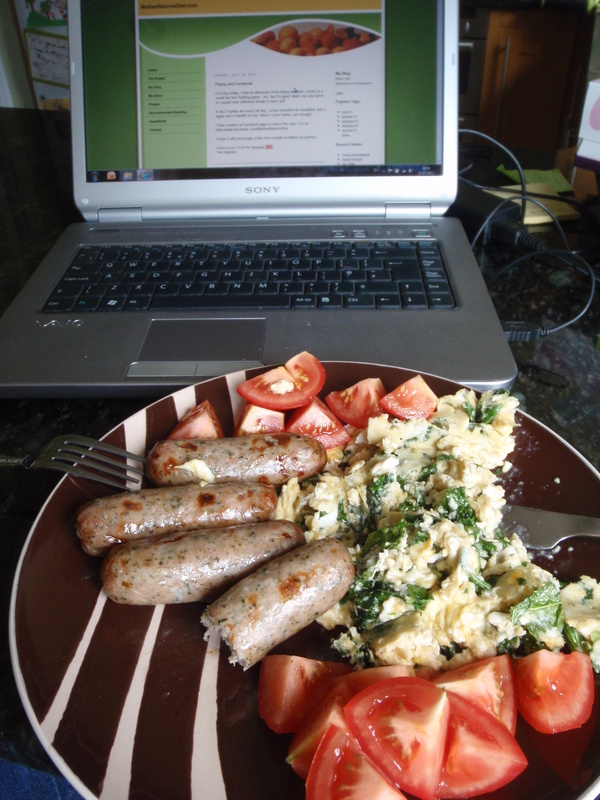 Breakfast – sausage and eggs, MND style. 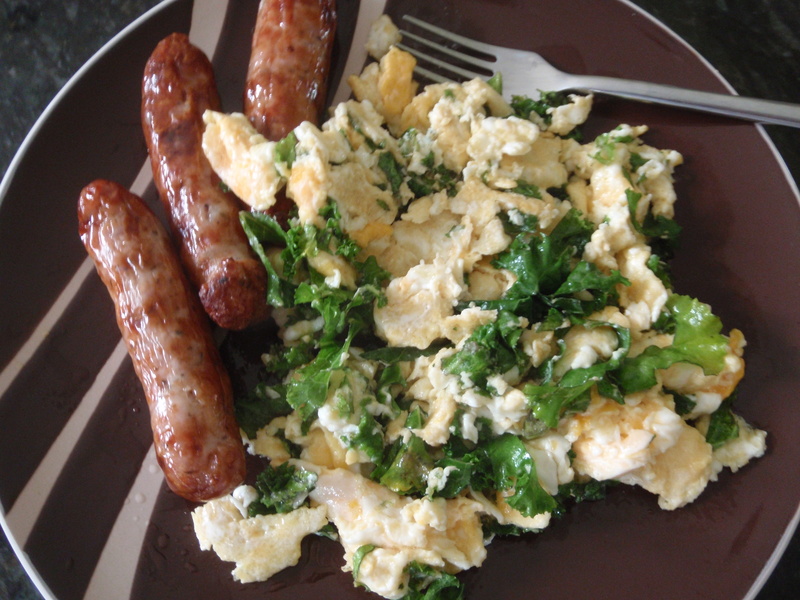 I grilled 4 outdoor reared pork sausages, scrambled a few free range eggs, with organic curly kale mixed into my eggs (I always add greens to my eggs now) and then served breakfast with a couple of fresh tomatoes! This post-early-morning-workout breakfast feast will keep me going for hours, and is a good example of paleo dining at it’s best in my opinion! Here is a sumptuous summer salad. 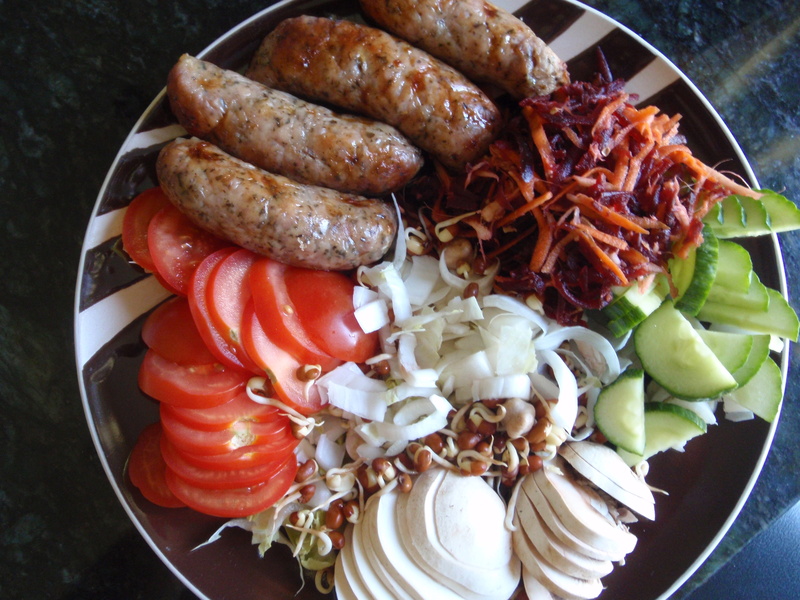 I grilled 4 organic outdoor-reared pork and herb sausages with my salad today. The salad contains – tomatoes, organic raw mushrooms, chicory, sprouted adzuki beans (a legume, not strictly paleo but I just have a few now and then), cucumber, and a mix of carrot, raw ginger and beetroot grated and mixed together. No dressing, of course, it’s not required, more than enough flavours in there already. You seem to have tomatoes in every meal. What would you suggest as an alternative for those people who cannot tolerate vegetables from the deadly-nightshade family? Yes, I do have tomatoes a lot, especially in the spring and summer half of the year. You could use any vegetables that work for you…peppers (some sites say they are from the same family? ), mushrooms, green beans, sugar-snap peas and all kinds of things. In almost all my recipes, the choices of veggies used are flexible and all the veggies are interchangeable – you can use fruit in some salads, raw veggies, whatever works for you. You could try leeks, courgettes…or if you can’t find a suitable substitute, just leave the tomatoes out! I hope that helps, thanks again for your question. Sounds yummy and nutritious but too much meat for me, I could of course use more variety of nuts or fish, not so keen on tofu or quorn, does that sound ok ? Hi Kate, yes just go with fish, eggs, nuts and seeds, not tofu or quorn, I quite agree. Hi Karl, I was wondering how many eggs do you eat in a day? I have read and heard conflicting information on the amount of eggs one person should eat in a day. i have read eggs do not actually raise you cholesterol as our liver produces less the more we get from our diet. I believe that free range eggs are a perfectly healthy food and I regularly eat 4 or 5 or 6 every day. I do not believe that eating eggs increases BAD cholesterol at all, so there is nothing to worry about.